More than one third of tablet owners use them in the bathroom. Mull on that, next time you see a Twitter update sent from an iPad. A new study reveals interesting tablet-use facts, but I'd love to see even more. 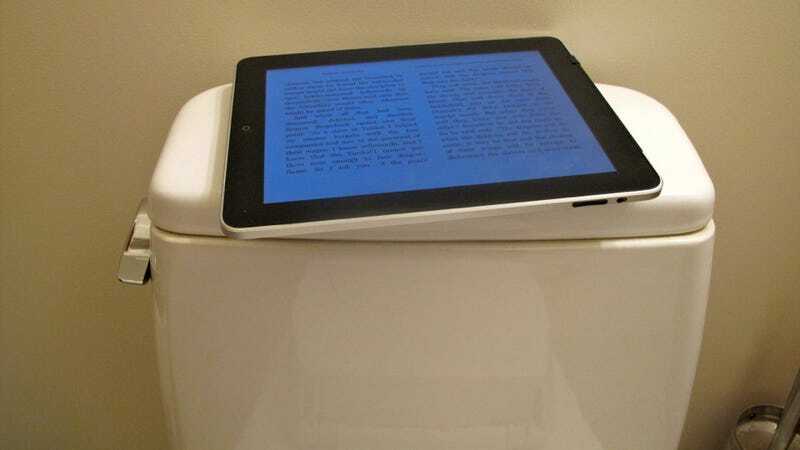 A study done by Staples finds that 35 percent of tablet owners cop to using one while pooping. Or at least, while in the bathroom. 78 percent say they use them in the bedroom, and another 30 percent say they've used one in a restaurant. The numbers are getting some play today, but isn't this all pretty expected? I mean, think about it, aren't those all places that people tend to read? Would you find it remarkable to see a solitary diner reading a newspaper at a table? Or to see a magazine stand in a bathroom? Or a book by a bedside table?